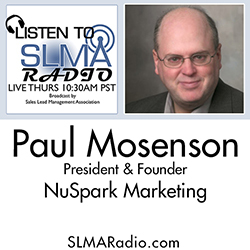 Hear Paul Mosenson, president of NuSpark Marketing defines ABM while truthfully dispelling misconceptions of ABM potential for small and large companies. How can SMB’s take advantage of Account Based Marketing? How do you measure account-based marketing? How do firms identify target accounts? How does ABM use predictive marketing tools? What is a technology stack, do you already have it and how do you manage it? What is exactly is an ABM ad platform and how do they work? A key element of ABM is content personalization. How is that managed? Can traditional top of funnel lead generation and lead nurturing still work? Why does it take so long to get started with Account Based Marketing? What is the single greatest hurtle to a quick ABM startup?